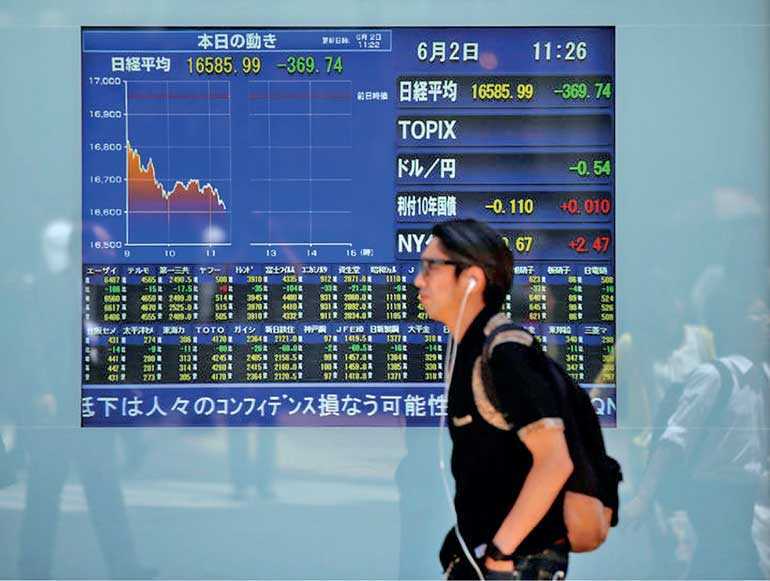 TOKYO (Reuters): Asian stocks handed back earlier gains and fell on Thursday, with Chinese markets fixed firmly on risks from the China-U.S. trade war and taking little comfort from an apparent easing in business tensions in North America and Europe. Spreadbetters expected European stocks to open mixed, with Britain’s FTSE and Germany’s DAX each slipping about 0.1% and France’s CAC inching up 0.05%. But MSCI’s broadest index of Asia-Pacific shares outside Japan dropped 0.3%, with broad gains across the region offset by losses in China. The Shanghai Composite Index slid 0.9% and Hong Kong’s Hang Seng fell 0.8%. Australian stocks were effectively flat. Japan’s Nikkei initially touched a three-month high following gains on Wall Street but pared gains and was last up a modest 0.05%. South Korea’s KOSPI was a shade lower. Major South Korean steelmakers such as POSCO and Hyundai Steel, however, gained after news that U.S. President Donald Trump signed a proclamation permitting targeted relief from steel and aluminium quotas from countries including South Korea. Sterling rose to a 3-1/2-week high $1.3039, extending its gains after surging more than 1% overnight. The euro was 0.15% lower at $1.1693, handing back the previous day’s gains. The dollar was flat at 111.65 yen after rising 0.4% overnight. The Chinese yuan lost about 0.2%, touching a six-day low of to 6.8332 per dollar in onshore trade. In commodities, Brent crude futures rose 0.2% to $77.28 per barrel and U.S. crude futures climbed 0.25% to $69.67 per barrel. Oil contracts had risen more than 1% on Wednesday, supported by a drawdown in U.S. crude and gasoline stocks and as U.S. sanctions reduced Iranian crude shipments.